Toast the pepitas on a small sheet tray in a 350°F oven for 6-7 minutes or toast in a small skillet over moderate heat. Peel pumpkin and spray with cooking spray or drizzle with olive oil; season with salt. Roast to just tender but not brown, about 25 minutes; cool. Shred pumpkin with the large side of a box grater or shred it with tines of 2 forks. Heat a large skillet over medium-high heat with EVOO, 2 turns of the pan. Add onions, garlic, salt, pepper and nutmeg, and sauté 5 minutes. Add stock and rosemary, and reduce heat to a low simmer. Stir in grated pumpkin and simmer 15 minutes. In a small skillet, melt butter over medium heat. Add sage and crisp leaves; remove to cool on a paper towel. 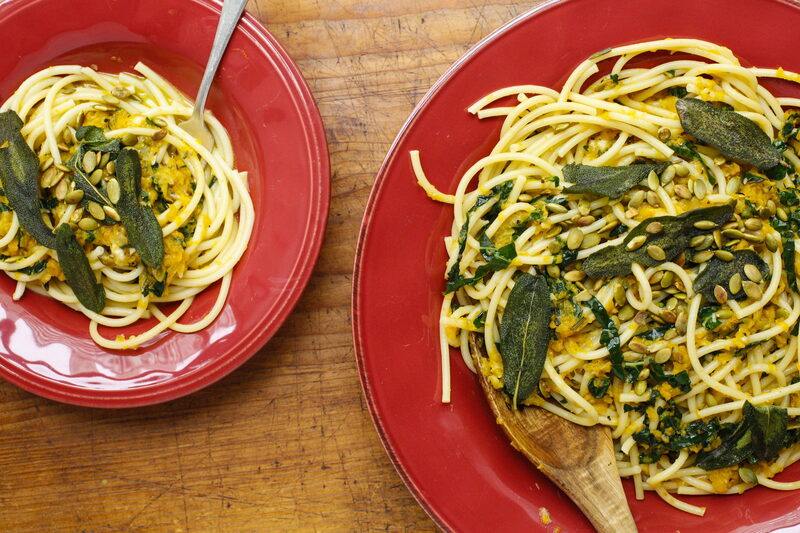 Pour brown butter into pumpkin sauce and wilt in the shredded kale. Salt boiling pasta water and drop pasta, cook to 1 minute less than suggested on package for al dente, reserving 1 cup water before draining. Add starchy water to pumpkin sauce. Toss drained pasta with pumpkin sauce and a few handfuls of grated cheese. Garnish with pepitas and crispy sage leaves. In Recipes-list.com we have selected the most viewed recipes from category - uncategorized . Enjoy the best recipes specially selected for you! Pumpkin Pasta is the right choice that will satisfy all your claims.